Click to viewGoogle Code is hosting the first third-party native application ever for the iPhone. 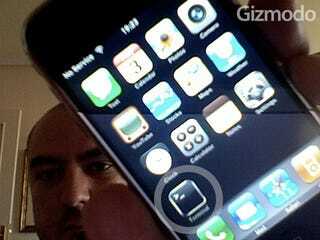 A real full-fledged iPhone application with a graphic user interface and its own icon in the iPhone home screen. Yes, this is not a Web 2.0 app but the real thing, as you can see in the picture and in the video demonstration after the jump. The application is MobileTerminal, "a terminal emulator application for the iPhone. MobileTerminal.app is NOT an SSH client, nor Telnet for that matter. It can however be used to execute a console ssh-client application." While most iPhone users won't find a terminal emulator exciting, there are plenty of reasons to get thrilled about this development. First and foremost, this is the first iPhone native graphical application done without an official SDK from Apple (there are others, but they are low-level.) This means that hackers are steady at work trying to do useful stuff with the JesusPhone beyond unlocking it and that more applications will follow. Second, if Google Code is hosting this it probably means either that 1) Apple is giving the nod to this kind of development, 2) they are going to release an SDK or 3) Apple will realize the need for people to access the iPhone as a development platform to do really cool stuff with it. All three options are good for me.